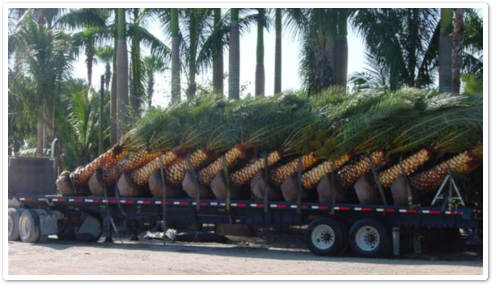 Sylvestris Palms by the truckload! We are super excited to be offering large numbers of these beautiful “Specimen Quality” Sylvestris Palms. We have always had a great stock of them in the past, but for this year we are planning on stocking larger sizes in addition to having bigger numbers in stock. If you’re looking to add instant Curb appeal to your home, we will have exactly what you are looking for ! Sunshine Ligustrum is a show stopper and is ideal as a low-growing hedge in the landscape. Sunshine Ligustrum offers year-round golden foliage that flourishes in full sun. Despite it showy foliage color it has a cold hardy rating to -10 Degrees! Everillo Grass: If you're looking to add a splash of color to a full sun to partly sunny area, look no further than the Everillo Grass. This amazing grass is completely cold hardy to -10 degrees and has a short growth nature of roughly 2 feet. It would also look outstanding as a potting plant with its droopy habit. Blue My Mind offers stunning deep sky blue flowers with silver-toned foliage. Blue My Mind is better branched and has larger flowers and more impact than ‘Blue Daze’ and is drought, heat, and humidity tolerant. Our experts will respond within 24 business hours.